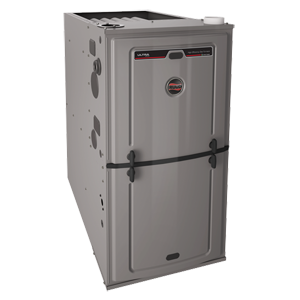 Experience reliability for years to come while also saving money and energy with the Ruud U96V Ultra Series Gas Furnace. This high-efficiency&apos; ENERGY STAR qualified series is engineered so that you don't have to think about being comfortable in your home – you just are. 96% AFUE This means maximum efficiency for you&apos; and may qualify you for local and/or utility rebates. Two-Stage Operation Provides superior comfort by knowing when to switch into high gear&apos; so there is no need for you to adjust the thermostat. Variable-Speed ECM Motor Uses less energy than a single-stage motor. It’s engineered for better dehumidification&apos; which provides you with better indoor air quality. EcoNet The U96V Ultra Series Gas Furnace is an EcoNet-enabled product that is compatible with the advanced&apos; easy-to-program touch screen EcoNet Control Center – where you can control all Ruud EcoNet enabled appliances. PlusOne Water Management System The industry's first blocked drain sensor will shut off your furnace when a drain is blocked&apos; preventing water spillage and potential water damage to your home. PlusOne Diagnostics our industry-first&apos; 7-segment LED display that makes service calls quick and easy.